After a spring or summer shower, you often find wild mushrooms and toadstools sprouting up in the lawn. They are fascinating to children, and they can also be deadly. Many wild mushrooms and toadstools are highly toxic. The most poisonous mushrooms are members of the Amanita, which are responsible for most of the mushroom-related deaths that occur each year. These mushrooms contain a substance, which causes liver damage. They are so poisonous that it is estimated that one mushroom cap from an Amanita can kill a man. Tragically, these mushrooms do not produce symptoms until many hours after they are eaten. By that time, treatment is usually of little value. Unfortunately, there is no way for you to tell the difference between a poisonous mushroom and a benign one. If your child eats a wild musroom, you have to take it seriously and call the poison control center or the emergency room. If possible, take samples of the ingested mushrooms with you to the emergency room. NEVER allow children to touch or eat wild mushrooms. NEVER bring wild mushrooms into the house. Teach children about the danger of wild mushrooms. 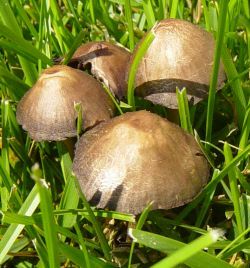 Eliminate mushrooms in the yard or areas frequented by your children when they first sprout.